Autumn in always-sunny Sun Valley, Idaho sees few tourists. Days are warm, nights are cool ― and rates drop at the area’s otherwise pricey hotels and restaurants. Just ask the lucky locals ― fall is the perfect time to visit. Sun Valley is 173 miles east of Boise. 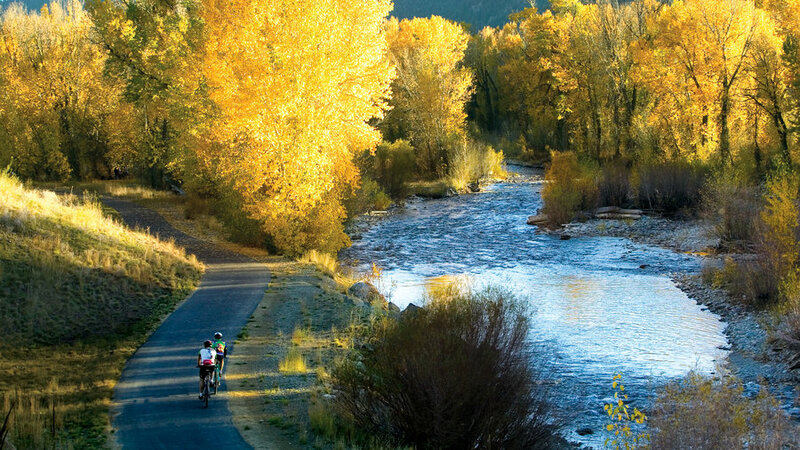 Bellevue, Hailey, Ketchum, and Sun Valley compose the 20-mile-long Wood River Valley. The Sawtooth National Recreation Area is 15 minutes north of Ketchum. Hailey’s Friedman Memorial Airport is the closest; those at Twin Falls and Boise are also good options. For more information, contact the or 800/634-3347). Boundary Campground. Bring an extra sweater and sleep under the stars. 9 first-come, first-served sites from $10; open through Oct; Sawtooth National Forest, Ketchum Ranger District; 208/622-5371. Knob Hill Inn. The fanciest lodging in town has 26 large rooms and a traditional European motif. A short walk from shops. From $250; or 800/526-8010. Cavallino Lounge. Swank new martini bar has become the hot spot in town. Closed Sun; 380 N. Leadville Ave., Ketchum; no phone. Ciro Restaurant & Wine Bar. Wood-fired pizzas, pastas, and wine list rival any you’d find in the big city. $$; 230 Walnut Ave., Ketchum; 208/727-1800. CK’s Real Food. A little house turns out dynamite dishes featuring local produce, fresh fish, and organic meats prepared with a sophisticated touch. Nice wine list. $$$; 320 S. Main St., Hailey; 208/788-1223. Java on Fourth Cafe. Local morning hangout with bagels, pastries, and the Bowl of Soul, a cinnamon-chocolate-espresso concoction. $; 191 Fourth St., Ketchum; 208/726-2882. Adams Gulch. Good out-and-back hiking and mountain biking, with golden fall color and views of rocky 8,275-foot Griffin Butte. From State 75 (11/2 miles north of Ketchum), turn east onto Adams Gulch Rd. and follow it to the end. Sawtooth National Forest; or 208/622-5371. Baker Lake Trail. A tree-lined 2-mile (one-way) hike climbs a slope in the Smoky Mountains to Baker Lake. Trailhead at west end of Baker Creek Rd. 162, 16 miles north of Ketchum, off State 75; Sawtooth National Forest, Ketchum Ranger District; 208/622-5371. Ernest Hemingway Festival. The second annual ode to the author and former Wood River Valley resident. The four-day festival includes tours of Hemingway’s haunts, film screenings, and a book fair. Sep 28-Oct 1; from $20; Dollar Mountain Lodge, on Dollar Rd., Sun Valley; or 866/549-5783. Sturtevants Mountain Outfitters. Pick up free hiking maps and rent rods and bikes. 340 N. Main St., Ketchum; 208/726-4501. Wood River Trails. A popular 22-mile-long paved system. Access at east end of Sun Valley Rd., Blaine County Recreation District; 208/788-2117.